What does God have to say to the world in the 21st century? Prophecy Now is an end-time prophetic journal received over a nine year period. Read of the coming revivals to Britain, Europe, and America, and learn of God’s will for many nations – including the unification of Korea! 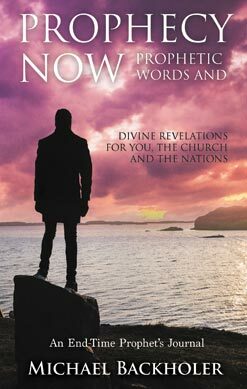 Discover what God has to say about prayer, the fulfilment of the Great Commission, the end-times, Islam, global warming, the economic climate, Christian media, spiritual fathers, and much more. Thus says the Lord, “And it shall come to pass afterward that I will pour out My Spirit on all flesh; your sons and your daughters shall prophesy, your old men shall dream dreams, your young men shall see visions; and also on My menservants and My maidservants I will pour out My Spirit in those days” (Joel 2:28-29). Michael Backholer was born in England a few years after the end of World War II. After a powerful encounter with God in the early 1980s, and a visitation from the Lord, Michael fully surrendered his life to Jesus Christ and came into the fullness of the Holy Spirit. In 1989, he was called into the hidden life of prayer and was released from working for an earthly master. Since that time he has also served the Lord in a number of countries from the USA to South Africa, and all over Great Britain. ‘Do not quench the Spirit. Do not despise prophecies’ (1 Thessalonians 5:19-20).